Last weekend visited Creswell Crags, ancient caves carved out of a limestone gorge. Wonderful strapline for the visitor centre: Inspiring visitors for 50,ooo years. There’s a drawing of a horse scratched onto a fragment of rib bone and evidence that mammoth, hyena, wolf, reindeer and woolly rhino once roamed the area. The horse engraving appeared in the excellent British Museum’s Ice Age exhibition three years ago. We were lucky enough to bump into ex-warden of the site HH who had once worked in the nearby limestone quarry, and was full of information about local geology etc. He pointed with his walking stick to the grilled cave entrances, and told us about Victorian amateur archeologists who’d been ‘a bit over-enthusiastic with their dynamite’. 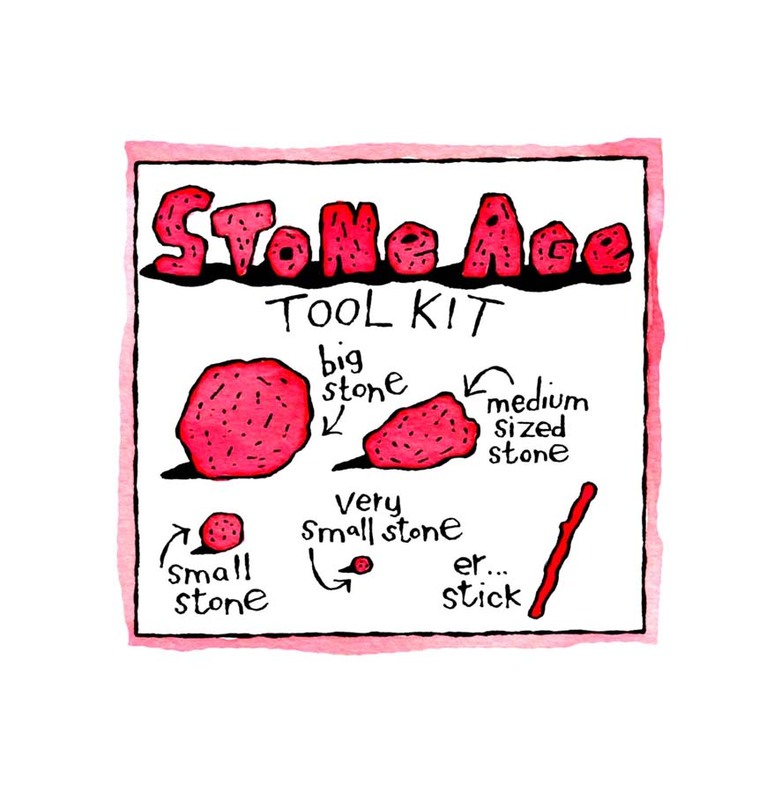 Tool kit drawing from The Comic Strip History of the World, a Kindberg/Turner/Bloomsbury production: Inspiring readers for 8 years (so far). This entry was posted in Drawings, Travels and tagged Bloomsbury, British Museum, Creswell Crags, Derbyshire, drawings, Ice Age, Nottingham, Stone Age, The Comic Strip History of the World, tool kit. Bookmark the permalink.